Aussie Day is just two days away. I woke up this morning thinking about what am I going to do on Tuesday? 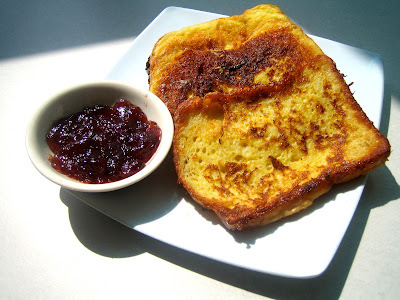 and at the same time I wanted to cook my favorite French toast, which I did. I just had it with my favorite Cranberry jam and finished the jar today. My French toast tasted different because of the vanilla and cinnamon. Thanks to Nigella Lawson & of course Jamie Oliver! Lunch time came and I was still thinking about Aussie Day (so obsessed) 'til I took my ladle and cooked some ginger pork and served it with to my Vietnamese friends. Then later on I had my Vespa lesson with them. I'm just happy that I was able to ride and run it! After falling 4x, I agree now with my Vietnamese friends that if I won't try and try I will never learn. So I believe that you have to fall several times or even more than the average before you really succeed on something. Night came, I decided to do some barbies since I doubt if I can do it on Tuesday after my Muay Thai class. I invited my friends from Sky Garden and Hung Vuong and we grilled the chicken and dory that I marinated. I also bought some fresh corn and they brought some sausages to be grilled too. And of course my Ginger Turmeric Lemon Rice never fails to amaze hungry stomachs. Thanks to my new found friend Quinn for bringing the griller. The girls had fun and before we actually started the barbecue picnic dinner at my veranda, my Russian friend Mischu arrived. He's the only thorn among the roses. I guess we all had fun. I hope next time I can finally buy my real griller.